Agriculture Box transforms under-utilised outdoor spaces into urban farms. We have been researching and growing organic food in a desert climate since 2010. We provide you the tools and knowledge to become self-sufficient in some of the food you eat so that you are able to be sure of where that food comes from. Enjoy the incomparable taste, quality and nutritional value of fresh home grown organic produce. Transform ordinary recipes into extraordinary gourmet experiences. Great food begins with great produce. Home grown produce is intense and aromatic, therefore needing smaller quantities to achieve the required flavour to your dish. Unusual crops that are often difficult to find and expensive to buy in the supermarket, are easy to grow. Salads, vegetables, herbs and fruit once separated from their source of nutrients i.e. plant or vine undergo moisture loss, nutrient decline and quality of appearance. The freshness of the produce makes a significant impact on taste and presentation to dishes. Crop your produce fresh from plant to plate to achieve the optimum from your food. Grow most types of vegetables, salads, aromatic herbs and some fruit on rooftops, balconies, terraces and gardens. Our turn-key solutions includes training on the principles of organic gardening for you or your staff. Taste the difference with Agriculture Box. PRIVATE RESIDENCES Nourish your family with the best food you can give them. Growing your own organically gives you control of what is going on to your food. Transform your outside space with an abundance of fragrant greenery and enjoy the nutritional benefits of growing ultra fresh, aromatic flavourful food at home. Enhance home dining experience with freshly picked produce straight from the garden. Growing food is a great way of introducing children to the joys of gardening and the benefits of eating fresh produce. It is a relaxing hobby for all the family. Our systems are transportable and can move with you, should you find a new home. Agriculture Boxes are set up in neighbourhoods all over Dubai. Taste the difference with home-grown. RESTAURANTS & LOUNGE BARS Grow your own organic gourmet, produce on site with a chef’s garden. Give your customers the freshest produce available. Let the produce speak for itself. The demand for healthy food is increasing, having superior produce keeps your customers returning and provides an opportunity to attract new clients by offering something unique in the region to health conscious customers. Raise the bar with a mixologist’s garden and grow your own botanical cocktails. Create herb-infused, garden inspired drinks menus. The Agriculture Box Gourmet Garden will then become an asset to your hotel or restaurant, delivering a very short return on investment. Our systems are set up in leading 5 star hotel resorts and restaurants all over the United Arab Emirates. SCHOOLS Grow an edible learning school yard and take the curriculum outside the classroom. School gardens are living laboratories where interdisciplinary lessons are drawn from real life experiences, encouraging students to become active participants in the learning process. Did you know that children who plant their own fruit and vegetables are more likely to eat them? For nursery and primary school children, who are not yet in charge of their food choices, a school garden is a great place to construct a foundation for healthy eating. Think of the school yard as an open-air classroom for cultivating, learning and tasting different fruit, vegetables and aromatic herbs fresh from the soil. Positive experiences in the outdoor classroom lead to new habits at home. The Agriculture Box Edible Garden Project enables hands-on-learning in a variety of educational subjects for any curriculum from pre-school to college or university. It includes educational charts, short lectures on the introduction to soil microbiology, composting, nutrition and the benefits of growing organic. Agriculture Box Enterprising Education Projects can also provide valuable funds for schools by pupils hosting market days and selling the produce to parents. Food growing also provides a practical opportunity for numeracy based learning and gaining business enterprise skills for every age group. Agriculture Box is a great way to start an Entrepreneur Club at your school. Mathematics: Counting seeds and plants. Measuring plant heights. Using fractions and percentages of the number of seeds that germinate. Science: Investigating what plants need in order to grow. Observing the life cycle of a plant. Recording the changes in plants through the seasons. Making weather observations through the seasons. Creating habitats for wildlife and watching the results. Carry out sustainable activities i.e. composting and producing organic fertilizer. Introduction to biology & soil microbiology by observing different kind of life forms in the soil. Geography: Studying the water cycle and weather pattern. Information & Communication Technology: Making scale drawings of the garden. Imputing data on the computer to produce graphs and charts. Investigating topics on the internet. Uploading gardening news on to the school website. History: Study of plants and their uses historically for eating, medicine and making dyes etc. Studies of gardening through history i.e. dig for history campaign. Food Technology: Harvesting food and learning how to cook it. Discovering the different tastes of freshly grown food. Nutrition and food awareness. Other activities could include gardening clubs, growing competitions & open days. Our systems are set up leading schools, colleges and universities across the UAE. 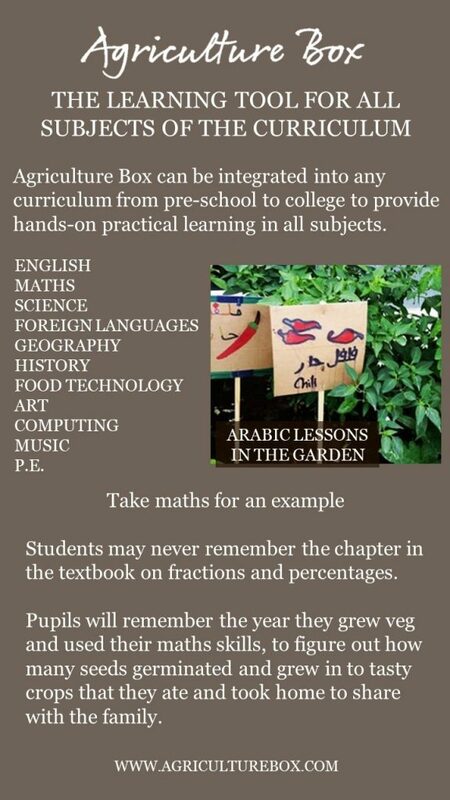 Transform under-utilised space at your school into an urban farm and grow a curriculum with Agriculture Box. CORPORATE GARDENS A corporate garden encourages people to get out of the office, socialize and is a great team building activity. In the garden everyone is at the same level. Agriculture Box enables you to grow your own gourmet food in the work environment. Colleagues have a place to relax and unwind while growing healthy food. The garden offers employees a bonus of a different kind, fresh, tasty and nutrient dense food. Connecting with nature, gardening is a great stress-buster! A short session in the garden is enough to take employees minds off the job for a while, leaving them refreshed and able to focus when back in the office.